Hello there! I’m back from Japan! I love you all! See you again soon! Friends in Los Angeles CA, and friends from online, I might cause you trouble, but let’s have a good time together;) I love you guys too! Now in Japan, having curry in the morning as a breakfast is popular way of the health so I ate bread and curry alternately for the breakfast…Mmmhm,lots of carbs…I knew it! but I couldn’t help it!! We finished our breakfast there, and did checking out our room, headed to Tokyo Dome City, and had experienced the Magiquest, next attraction we went was this! 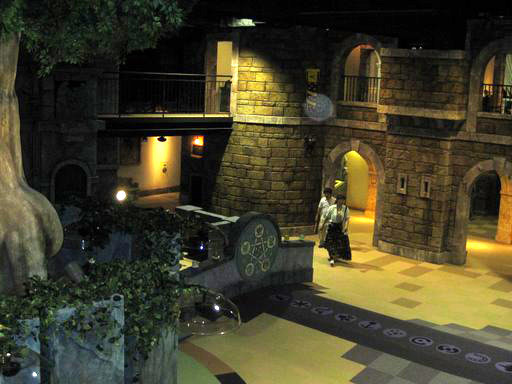 The world’s famous greatest theif, “Lupin the 3rd“(Japansese Anime) walking through attraction(Japan only). When I was kid, I watched this anime a lot. Before the experiece of Lupin the 3rd, of course I took a picture! and then got inside…This attraction was unique and I’ve never experienced this type of attraction at any other amusement park before. It was good. After this Linear Gale, got so tired, and done. Took pictures with Mr.Hara of SAMURAI JAPAN. Japanese sweets again. It was Green tea pudding, warabi mochi and ice cream. Next time, I wanna go to Laqua. They have natural hot spring in Laqua. there is an amusement park and lots of fun stuff. I tried some too. 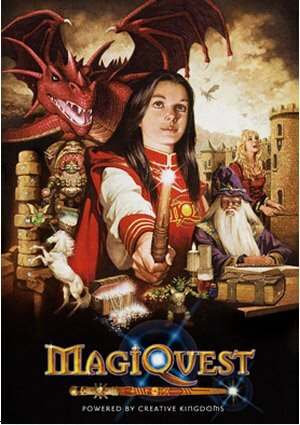 Magiquest reminds me of Harry Potter or Narnia world. 宝箱発見！I found a treasure box! How simple minded I am!! I found another Magiquest in Santa Ana in CA. want to go ??? anybody ?? Dinner time at Artist’s Cafe on 43rd. I was a kid, when the first time I had fell in love with Jon Bon Jovi! They also had Michael Jackson, Rolling Stones on the wall. Very interesting! but the view from the 43rd floor was great. Next is the last day of the Tokyo Dome. 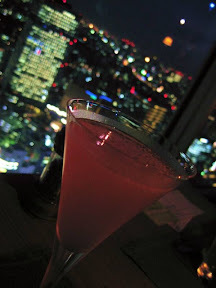 母の親友に東京ドームホテルに連れてってもらったよ♪　One of my mom’s best friend took me to TOKYO DOME HOTEL for 1 night stay. 客室へつながるエレベーター。かなり高速っｗ　さすが日本のハイテクエレベーター！The elevators to the guest rooms…It was fast speed elevator! Bravo! Japanese high-tech! Our room was located on 26 floor out of 43rd floors building. It’s nice view from there! Japanse Idol Group, “KAT-TUN” Live concert has been going on at the TOKYO DOME so there were lots of young groupies outside. Man! この日、ホテル到着してすぐ、４３階にあるレストラン、「アーティスツカフェ」にディナーの予約を入れ、予約の時間までまだ時間があったので乾杯しようということで、下の階のBar 2000にて軽く１杯。目の前東京ドーム真正面を一望でき、とても大人な雰囲気のバーでした。Just right before the dinner time, we still had time for the reservation at “Artist’s Cafe“, we stopped by the bar called,”Bar 2000“. That’s it for the Part1 now. Exhibition of products of Hokkaido have been held in my hometown Hachioji between 5/19 to 5/25. Hokkaido food is superb in Japan. Tasty milk, seafood, fruit,vegetables a lot more. If you want to eat delicious food in Japan, I would recommend you to go to Hokkaido. I saw lots of people in this exhibition to get delicious food on Tuesday morning. I was one of them too. Lots of good food made me difficult to make a decision what I should get. This cheese omelette is sooooo good. I felt as if it was meling on my toungue. I looooove bread!!! Pullman Bakery‘s signature is this deep fried curry sauce bread. I got 4 of them. This is the Pullman Bakery’s number 1 hit product. You can eat this bread without butter. Mmmmm, yummy! This milk and yogurt were taken by Jersey cattle. 1 liter was sold about $5 bucks!!! ha ha ha ha ha…thick taste though…it’s really good. I feel like I’m going to become a pig already…Oh no! American Idol was over…Although I’ve seen lots of talented contestants in this season, he’s the Most memorable unique contestant from this season’s American Idol. Soooo hilarious! http://widgets.clearspring.com/o/49e3b4acb258ffb9/4a160541a840083d/49e3b4ac3aaff91d/a733a9f1/widget.jsWant more American Idol videos? Click here. It held a memorial service on the 7th anniversary of my mother’s death on May 17th. Actual anniversay date is 21st of May. Relatives and her close friends got together again. Thank you very much for coming! My mom, Rumiko Sako who’s loved by everyone as the greatest mom,friend,former teacher. With the strength, I’ve tried not to cry in front of people, but I couldn’t do that any more…maybe I got older…or something? Her lines and memory made me feel sad and cry…Everytime I feel what if…,it made me feel disappointed. I’m very glad and thankful to be loved and still taken good care of by you guys. It wouldn’t happen without my mom’s natured. Thank you! This is my mom’s whole time favorite sushi restaurant. We ate finest quality sushi and did not stop talking about my mom for while there. These are the course menu. Finally, new flu spreads to Tokyo. The student who lives in Hachioji got infected! I think just because of that, I saw more people wearing masks at the Hachioji train station today. Of course, I was not wearing mask. If anyone cough without masks, I feel a little bit nervous though. Be more cautious. Ki wo tsukenaito, kowai ne! I’ve been staying in Japan since 15th of May. It’s not summer time yet, but so hot outside during the day in Japan. I could get easily sweaty when I’m walking…ahhhh! It’s hot!